I cam across a whetstone bridge years ago so that razors could be honed at your sink. 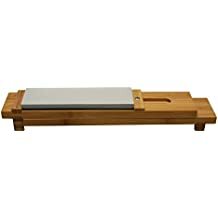 the bridge held a whetstone, with wing nut adjustable wood stops to hold it in place, also the were two legs that were also adjustable so that you could fit the depth of your sink, and as a result you not have a mess to clean up. anyone use it or one like it and what area your thoughts ? I don' t use one. But honestly I do see the point. Every time I put a stone in its box on the sink and the thing starts moving, I think 'I really should get me a stone holder'. My piece of granite to flatten hones is cut so it fits on my sink. The faucet is set to drip , drip. Your sink/counter top height is a comfortable height to work at. The main problem I see with the OP is water running or dripping on wood in the long term could be an issue. That is one of the troubles with modern building codes in my opinion. I make my house comfortable to me. If you don't like it don't live in it or buy it. Or remodel it to meet your needs. I agree with that. At my work a person may not know and the burn themselves unintentionally. At my house I run my water heater at a low temp but that is my choice. I take a shower with the hot only on. But this is my choice and in my control. Why should the government be involved?????????????? ?